It doesn’t matter what kind of toothpaste or toothbrush you use, if flossing isn’t part of your daily routine, you’re not getting your teeth as clean as you could. Flossing cleans your teeth and gums where a toothbrush can’t reach. It gets rid of food and debris stuck between your teeth and beneath the gums. Flossing can help with bad breath and prevent cavities. It’s also an effective way to remove bacteria-containing plaque. Exposure to bacteria in plaque can lead to gum disease, tooth loss and other health problems. Your gums want you to floss. If you don’t floss regularly, you’re hardly alone. A federal study found that nearly one-third of American adults never floss, and only about 31.5 percent said they had flossed every day in the previous week. Some people don’t like to floss because they’re in a hurry or they’re using improper technique and it hurts. Others mistakenly believe that it doesn’t matter whether they floss. Yet, when patients come in for their checkup or cleaning, we can always tell by looking at their gums whether they’ve been flossing. Patients who floss have healthier gum tissue. To make flossing a daily habit, keep a container of floss next to your toothbrush as a reminder. You can also stash a small box in your purse or your car’s console. Try different kinds of wax to see what works best for you. You might like waxed floss because it’s less likely to shred. Some people like using cinnamon or mint-flavored floss because it helps freshen their breath. Aside from traditional floss, you can use other types of interdental cleaners to remove debris and plaque, but they usually don’t clean as effectively. However, if you prefer to use these tools, they are better than not flossing at all. They also can be a good option for some children. If flossing hurts your gums, make sure you’re using proper technique. You want to move the floss between your teeth using a gentle rubbing motion. Curve the floss into a C-shape against your tooth when you reach the gum line. By doing it this way, the floss will slide easily between the gum and the tooth. 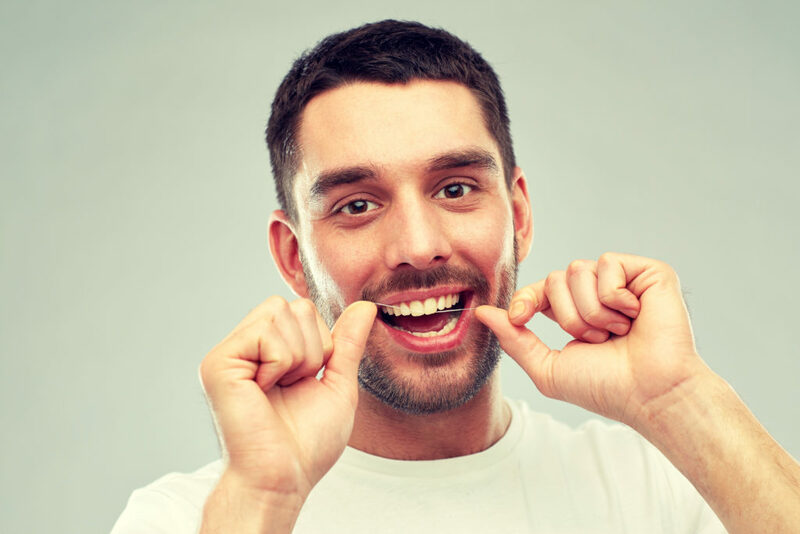 It’s normal for your gums to bleed a tiny bit or to be sore when you first start flossing regularly. After a week or so, they will toughen up and the bleeding will stop. If you notice that your gums are bleeding regularly, make sure you see a dentist promptly. If you’re not sure you’re flossing properly, ask your dental hygienist or dentist to show you at your next appointment. At Konikoff Dentistry, we are happy to help you keep your gums and teeth healthy. Dr. Mason Campbell sees patients at Konikoff’s Lynnhaven Parkway location in Virginia Beach. Request an appointment online or call (757) 416-1400.